Since 2004, Dragon Gate has pumped students out of its dojo at a high rate. Starting with Shingo Takagi, we’ve seen fresh faces like Akira Tozawa, BxB Hulk, Kzy, and Kotoka emerge from the depths of the dojo. We’ve seen a handful of great classes since its inception. In 2006, Hulk, Tozawa, and the now-retired Katsuo burst onto the scene. A year later, Cyber Kong (by way of the US dojo), Kzy, Lupin Matsutani, and Mondai Ryu began their journeys in Dragon Gate. In 2013, it was Dragon Gate’s Millennials: T-Hawk, Eita, and U-T that were marking their territory. While there have certainly been some duds to come out of the dojo like the aforementioned Matsutani or Kenshin Chikano, it’s obvious that the promotion has been able to pump out talent for 15 years consistently now. In 2016, Dragon Gate possibly entered another golden age in the dojo. Shun Skywalker, Hyo Watanabe, and Yuki Yoshioka (as well as bonafide main eventer Ben-K) debuted in the company and immediately made their mark. Injuries caused setbacks to the careers of U-T and Kaito Ishida, who, by the start of 2018, were more or less on the same plane as the 2016 class. By the end of the year, Dragon Dia and Kota Minoura were added to the fold. With all of this young talent, Dragon Gate decided to pit them against one another. A Rookie Ranking Tournament was formed at the start of the new year. This gave the fans and the competitors themselves a chance to see how the rookies stacked up against one another. 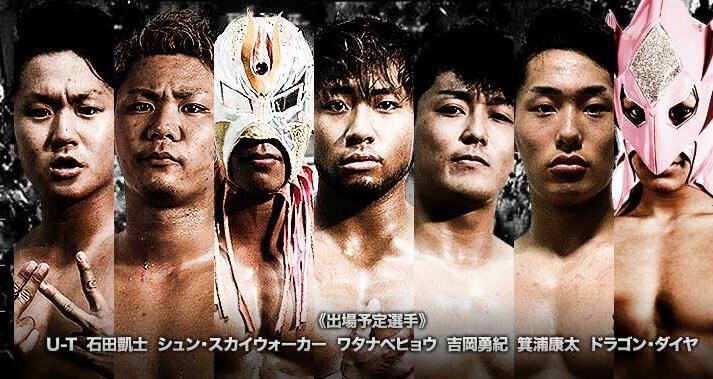 That led us here: a look at what we’re dubbing the 2019 Dragon Gate Freshman Class. This piece will be a one-stop guide with information, match recommendations, and projections for the seven competitors in the Rookie Ranking Tournament. Dragon Dia came into Dragon Gate with more hubbub than any rookie in recent memory. After spending 18 months in the Dragon Gate dojo, he debuted with the company in Korakuen Hall in a tag match with his mentor, Dragon Kid. His debut was a moderate success. Despite being pinned by Yasushi Kanda, it was clear that Dia had potential to be something. Dia is someone that my eyes immediately jump to when cards are announced for Dragon Gate. He’s a young boy six months into his professional career, but he came in with a prominent gimmick and unlike most rookies who debut and rebel against the veteran class, Dia struck up an immediate partnership with Dragon Kid. If you compare Dragon Dia to a very young Dragon Kid, there are a ton of similarities. Much like his mentor, Dia is struggling to find a balance between their innovative offense and wrestling like a seasoned pro. Dia, as of now, doesn’t have any game-changing offense like Dragon Kid did during the early stages of his career, but that doesn’t mean that he’s not exciting to watch on offense. Perhaps a big signature move or two could help launch Dia ahead of some of the other rookies in his class because thanks to a loss to Shun Skywalker, followed by a case of the flu, he finished 7th in the 2019 Rookie Ranking Tournament. Dia’s ceiling is similar to that of his mentor’s; he’s an Open the Brave Gate Champion on his best day. Unfortunately, his floor could be a short, injury-filled career. Dia is small, even next to his Dragon Gate contemporaries. I love Dia’s upside, but there is a part of me that fears for his future. He could become the second coming of Dragon Kid, or he could follow a path similar to Kotoka’s where he is bombarded with injuries and setbacks because of his smaller stature. It should be noted that Watanabe’s biggest accomplishment is a stretch that, without the help of Hyo Watanabe superfan Mike Spears, would’ve been largely forgotten about. Hyo Watanabe’s stock has plummeted faster than Enron’s did at the turn of the century. Watanabe drew comparisons to CIMA for the first few months of his career. Whether he did or not is uncertain, but Watanabe moves around the ring like he spent his teen years engrossed in footage of CIMA during his run on top in Toryumon. Draped in leopard print, Watanabe moves around the ring at a blistering pace. When he’s at his best, he uses his dropkick with deadly precision. His dropkick is the best part of his offense. Unfortunately, dropkicks don’t win championships. In Watanabe’s case, they don’t even win matches. Since convincing Masaaki Mochizuki to start the Mochizuki Dojo in August, Watanabe has gone 9-26-3 in Dragon Gate matches. Of those eight wins, he scored the fall in four of those matches. Three have been against Kota Minoura (one in a dark match, one on Prime Zone, and one in January 2019) and one was over Problem Dragon in an undercard tag match. Twenty-six losses in that time period is an obvious eyesore, but the three draws might be more telling. In the three months, he’s gone to five-minute time limit draws with Bitman, Problem Dragon, and Misterioso Jr.
Bitman is a Hong Kong native who appeared on the undercards of a few Dragon Gate shows before suddenly returning home, Problem Dragon is the company’s top loss post, and Misterioso Jr is a Los Angeles native who randomly showed up in Dragon Gate at the end of 2017, and is now doing it at the start of 2019. Watanabe being on the same tier as these men does not bode well for someone that once looked like a can’t-miss prospect. His Rookie Ranking Tournament ended in abrupt fashion when he was pinned by one of his closest contemporaries, Yuki Yoshioka. He was quickly ousted from a tournament that is going to be used as a launching pad for at least one of the members of his class. If I were Watanabe, I would go to the drawing board and begin attempting to rewrite history immediately. Unfortunately, his ceiling right now is a Brave Gate challenge. I see no signs that the company has any intentions of putting gold around his waist at this time. His floor is his current career. He’s doing nothing. He’s treading water. He needs help. Kaito Ishida’s career was derailed by an injury in Dragon Gate’s turbulent January 2017. It appeared that he and Takehiro Yamamura would be generational partners, either teaming or feuding for the bulk of their career the same way that Masato Yoshino and Naruki Doi or BxB Hulk and Shingo Takagi have throughout their time in Dragon Gate. Instead, Ishida’s momentum was iced and Takehiro Yamamura became a star in one night. Kaito Ishida is going to be really good, you guys. That is until September 2018 when he linked up with Masato Yoshino, Naruki Doi, and the rest of the MaxiMuM crew. Finally in a unit with purpose, unlike the failed Over Generation experiment, Ishida immediately changed his gear and hair to embody the unit more, and within the blink of an eye, became the most exciting member of the Dragon Gate roster. His feud with U-T, which closed out 2018 and has now carried into 2019, is fueled just as much by a yearning for a spot at the top of the card as it is by hatred. Ishida and U-T are the two elder statesmen in this rookie class, ironic considering how young the two still look. They’ve both been in the company long enough to see figureheads change, units shift, and crowds turn over. For Ishida, he has something to prove to himself. He finished second in the Rookie Ranking Tournament and is now on the best run of his career. This is all happening as his former friend, Takehiro Yamamura, is plans to return to the ring in February. Ishida is showing that despite the burst of star power that Yamamura earned in February 2017, Ishida can kick down doors, kick off heads, and kickstart a legitimate run up the card in Dragon Gate. His ceiling, to me, screams Twin Gate Champion. I love the way Ishida works tag team matches. He’s gifted at taking punishment and dishing it out. He’s bounced around with different partners since joining MaxiMuM, but I’d really love to see what he and Jason Lee can do with an extended partnership. His floor? We’ve seen it. An undercard act with moments of brilliance, but is unable to flourish due to either injuries, booking, momentum, or a combination of the three. Minoura joined the Dragon Gate fold on July 5 and received a welcoming present in the form of a Ben-K spear. His debut was an interesting one, though. He got a noticeable amount of offense against established stars like the aforementioned Ben-K and Masato Yoshino. He only worked one dark match exhibition, a draw against Hyo Watanabe in June, and then was quickly ushered onto the Dragon Gate undercard in Korakuen Hall. A month later, Minoura had adopted a color scheme and had moved past the young boy black trunks. Despite a losing record since debuting with the company, it’s clear that Minoura has a ton of potential and now entrenched in the Mochizuki Dojo, I expect Minoura to be a winner sooner rather than later. He took a first-round loss to U-T in the Rookie Rankings Tournament and then lost to Watanabe days later in the 5th & 6th place decision match, but I chalk that up to paying dues. Right now, Minoura has all the momentum that someone like Hyo Watanabe would desperately hope to have. I would keep an eye on Minoura and his interactions with Oji Shiiba when the latter returns from injury. The two came into the company a few months apart and from their early interactions, they’ve shown they have strong chemistry with one another. Plus, Minoura is getting a ton of praise in this piece while Shiiba is nowhere to be found. That’s what you get for being hurt at the wrong time. Minoura’s ceiling is undetermined as of now. He’s too young into his career to estimate. He’s not much bigger than U-T, but he’s toned beyond belief and has shown no signs of early decay. I like Minoura. I wouldn’t bet the house on him, but I’d invest some stock in his future. It’s clear Dragon Gate has already. The MVP of this class. Shun Watanabe made his televised debut on August 21, 2016 in an eight-man match with the likes of Kaito Ishida, Takehiro Yamamura, Hyo Watanabe, and El Lindaman. His peers challenged him to put his best foot forward at the start of his career, and since then, he has done so. In November, Skywalker adopted a neon green set of gear with a mask to go with it and changed his name to Shun Skywalker. From there, he was off to the races. Skywalker is arguably the first one from this class to make any sort of real impact in Dragon Gate. The other argument that could be made is that since U-T was a champion early in his career, he gets that nod. U-T was the obvious loss post on a Triangle Gate team, though, so I’m going to give this victory to Skywalker. In mid-2017, it became obvious that Dragon Gate was building undercard matches around him and his best spots. For a while, it seemed like every Korakuen or Big 5 PPV was going to have a match that centered around either his Asai Moonsault to the floor or his top rope Moonsault that often resulted in a pinfall. He muscled his way into the 2018 King of Gate lineup and finished with a 1-3 record, thanks to a count out victory over Yasushi Kanda. This wouldn’t be the only tournament that Skywalker found himself in that year, though, as he and Masaaki Mochizuki took their talents to All Japan Pro Wrestling in August for the All Japan Jr Tag Battle of Glory. He and Mochizuki gained three victories in the tournament over the course of six matches and in the process, the gained respect from the likes of Shuji Kondo, Kotaro Suzuki, and TAJIRI. Skywalker has now come up short in three title matches. He and Willie Mack put on a spectacle in Korakuen Hall that Skywalker ultimately lost. He returned to teaming with Mochizuki and barely escaped death during their Twin Gate challenge in September and then once again with Mochizuki (and now Yuki Yoshioka), came up short in their quest for the Open the Triangle Gate Championship in November 2018. He won the 2019 Rookie Ranking Tournament. He’s beginning to build a portfolio full of great matches, but more importantly, big match experience. Skywalker, as crazy as it sounds, has to be looked at as a possible Open the Dream Gate Champion down the line. It’s clear the company is behind him and quite honestly, I’m behind the idea of Skywalker’s ascent up the card. Unfortunately, his look and in-ring style might cause him to crash and burn the higher up he goes on the card. He could be plagued by injuries and bad botches. I hope that’s not the case, because Skywalker is quite the talent. With Kaito Ishida, I feared that his potential was once a lost cause. With U-T, I never saw it. I never got U-T. He debuted with the company and was immediately pushed alongside T-Hawk and Eita as The Millennials, a can’t-miss unit full of red-hot prospects. U-T quickly fell out of favor with T-Hawk and Eita dominating, Flamita quickly catching on, and Yosuke Santa Maria, El Lindaman, and Kotoka being added to the group as time went on. U-T was an obvious fall post considering how loaded this unit was. When he wasn’t taking pinfalls, he was on the shelf. He missed a handful of months in 2014 due to injury and was forced out of action for nearly a year between 2016 and 2017. U-T is a tiny individual, certainly no bigger than someone like New Japan’s Taiji Ishimori, and for a long time, the physical style of Dragon Gate was too much on his body. That is until August 2018 when U-T began wrestling with more of a llave-influenced style, which was made famous by Milano Collection and the rest of the Toryumon 2000 Project. Quickly, he began scoring more falls on house shows, which soon transferred into televised victories. By December, U-T had momentum for the first time since he was strapped to the rocket pack in his debut. He’s now a cerebral killer, a drastic shift in direction from the subpar high-flyer who’s biggest strength used to be hyperactivity. His feud with Kaito Ishida was my favorite thing in the company for the last quarter of 2018. While Ishida is fighting his way out of Takehiro Yamamura’s shadow, U-T is fighting for a chance to stay alive. He’ll be coming up on his sixth anniversary with Dragon Gate this summer, yet he’s being listed as a rookie by the company. The run that he’s currently on is the only thing he has to cling onto. His size will prevent him from ever being a Dream Gate champion, but I’d be lying if I said I don’t get excited at the idea of U-T at least challenging for the Brave Gate title. If Kotoka could win it (from Akira Tozawa, no less), then there’s no reason that the smaller-sized U-T can’t also win the Open the Brave Gate title. That’s his absolute ceiling, but with the momentum he currently has, it seems plausible. His floor is returning back to taking falls in opening matches. His 2014-2017 was a dark time and I, for one, hope he never returns to that position again. Yuki Yoshioka is the hardest rookie to read. He is firmly in the middle of the pack. He isn’t on a blazing hot run like U-T or Ishida, but he’s not falling behind like Hyo Watanabe. He’s a steady hand who is quietly done some really good work behind Masaaki Mochizuki and, at times, Shun Skywalker. He’s the forgotten piece of the infamous 10-man veterans vs. rookies tag, as we’ve seen Ben-K rise to the main event scene, Skywalker become a rookie ace, Watanabe fall to the bottom of the card, and Katsumi Takashima leave the company. Yoshioka was there, but he’s not making any headlines. I really like the work he’s done with Mochizuki Dojo, and I have a feeling that his style now will be the style he works with for the entirety of his career. Yoshioka’s pro-comparison would have to be Genki Horiguchi. Horiguchi has been with the company for years but has never been a Dream Gate winner. He never will be. Horiguchi thrives in multi-man settings when he’s allowed to put together jaw-dropping finishing sequences with the aid of his many flash pins. I see a very similar future for Yoshioka, who constantly blows my mind with his unique pinning combinations. Yoshioka is someone who could rattle off a ton of wins and get really hot, really quick if Dragon Gate wanted him to. He’s far more polished than his flying counterpart, Shun Skywalker, and now shows more charisma than Watanabe. There are rookies in this class that could go up in flames at any moment. U-T could retire due to injury, Skywalker could botch badly in a big match and kill his momentum, and Dragon Dia could never pan out as the second coming of a legend. Yuki Yoshioka seems like a safe bet to stick around for a long time. His best career is one marked with a signature Twin or Triangle Gate reign. His worst is a career in which he’s never elevated from his current position. I would find the latter very hard to believe.